This lesson demonstrates how to find the uncommon lines in two containers, this is a useful function for comparing lists. 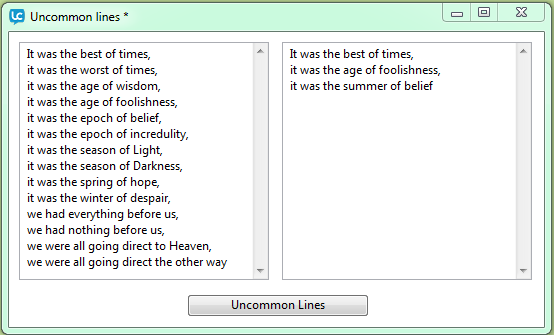 The uncommonLines function takes two lists, finds the lines that are in one list, but not in the other, and marks them with a leading "+" or "-" depending on which of the two lists the line is found in. If you start with the first list, add the lines marked with "+", and delete the lines marked with "-", you get the second list. The handler goes through each list in turn, and builds a third list consisting of the lines that the lists don't have in common. First, it uses a repeat control structure to scan each line in the pFirstList parameter. If the line doesn't also appear in the pSecondList parameter, the handler adds that line to a variable called tUncommon, prepending a "-" to the line with the && operator. (The && operator places a space between the "-" and the text of the line for better readability.) It also adds a return character so that the next line added will start on a new line. Next, the handler uses a similar repeat loop to scan each line in pSecondList. If the line isn't in the pFirstList, the handler adds the line to the tUncommon variable, prepending a "+" this time. Since the handler adds a return character to tUncommon after each uncommon line it finds, the last character of tUncommon is a trailing return. The handler deletes this trailing return and then returns the contents of the tUncommon variable. Many languages support this form of repeat loop, and Transcript does too: this form will work the same way as the one we used. However, the repeat for each form is much faster--depending on the circumstances, up to hundreds of times faster--than the repeat with x = start to end form.